The David and Goliath Story deals with bravery and unconditional faith in God. The people of Israel elected Saul as a king. He was to lead the twelve tribes in a war against the Philistines their long time enemy. The two armies were lined up facing each other across a great valley. While both armies were big and strong the Philistines had a secret weapon - a giant named Goliath. Twice a day for forty days Goliath came out and challenged the Israelites to fight him. "Let us avoid a full battle, one of you come and fight me. If I win you will submit to us and if your champion will win, we will submit to you." he said. Everyday Goliath came out and repeated his challenge and everyday the Israelites and king Saul became more afraid since they thought no one can defeat the giant. One day, David, a young and simple shepherd came to visit his brothers at the encampment. When he heard of the challenge he went to king Saul and said, "I will fight this stranger." Everyone including the king doubted David's ability. But David was confident that the God will be by his side. 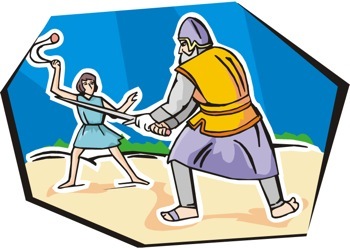 With a slingshot in his hand and five smooth stones in his pocket David walked towards Goliath. He hit him right in the middle of the forehead and Goliath fell to the earth. Quickly David was on top of him. He took Goliath's sword and cut off his head. Seeing this the Philistines army run away and the people of Israel won the war. 1. Believing in yourself is the key to success. "I think I can", becomes "I did it!" I like to ask the children open ended questions such as: "Where you ever in a situation similar to this one where you had to deeply believe that you are able to do something unthinkable?" Use this point to teach children about the power of positive thinking. 2. David believed that God is with him and will help him fight against Goliath. By accepting that God is by our side and is here to protect us and help us fight our battles (big or small) we feel safe and secure. This security helps us tackle and deal with problems more easily. Our unconditional faith in God gives us strength and gives us a positive mindset.